and painting this SWAN in Genesis Heat Set Oils. Oh! I finished last week's piece in Pan Pastel - the "The Magnolia"! I posted it on my ViaVon FaceBook page, IG and Twitter, but thought perhaps you'd like to see it as well here. Friday, April 12th is another LIVE YouTube Stream with me. I'm going to be showing you some new Arteza products I purchased because ... well ... I just saw potential for my card making adventures. :D I have Arteza's Gouache and thought it a really good product, especially for someone new to gouache, so thought I would give some of their other products a try as well. I'm also going to show you some really cute Leather Traveler Journals I picked up on an Amazon Daily Deal. And, I also got a set of Jerry Q Art's 24 Watercolour Pocket Set, which Janet Young introduced us to this past week. Mix some Genesis Heat Set Oils, using the book: 1500 Colour Mixing Recipes for Oil, Acrylic and Watercolours that I reviewed on my YouTube channel on April 1st. I'll be using this Genesis Heat Set Oils Chart, which has the Pigment information which we can use to correlate back to the pigments listed in the book. I'll be LIVE YouTube streaming this Friday, March 30th at 10 am. EST, where we will looking at mixing pigments in an assortment of mediums, how to assess your pigment values, and how to use a light pad/board efficiently and effectively when needed. 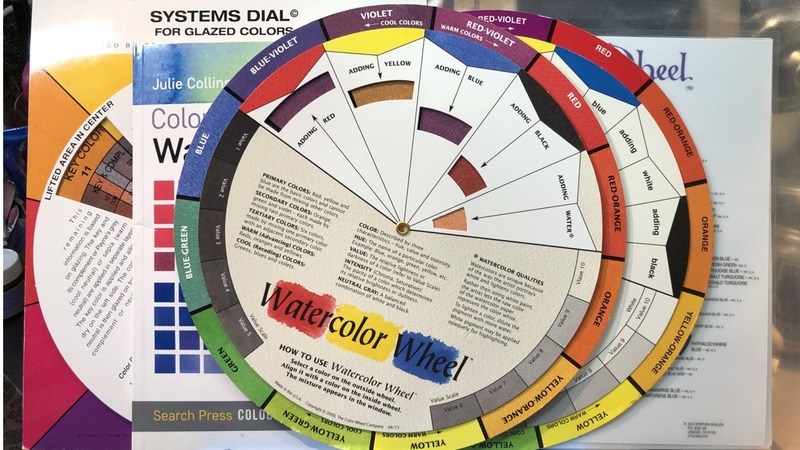 Also we will look at this Watercolour Colour Wheel. Composition and Pigment Information of Winsor & Newton's Professional Watercolours. We will look at the Light Pad/Board and various ways to use it for your painting needs. Yes, life has been a challenge for quite some time as health issues within our family have impacted us all in so many ways with struggles, surgeries and hospice too. I've pushed myself to get back to the painting desk whenever I can, even if only a few hours a day. I've dusted off the materials -- all of them -- and began LIVE streaming two weeks ago, with my 3rd expected tomorrow. I will also be adding some regular videos on projects I'm working on. My YT channel is linked there on the right and you can see me LIVE every Friday morning at 10:00 EST. The LIVE streams usually upload directly or shortly afterwards with chat included so you can watch later. I've also added a PIP - Products I Prefer page which may be of benefit if you're watching my videos and have questions about them. I'm active on Twitter and posting on my ViaVon FB Page - both are linked on the right. I do have an Instagram page now too, which isn't linked yet, but you can find me there by searching MyViaVon. So there ... that's what's happened since I last visited here. I hope this finds you healthy and being creative! The Fun of New Adventures! The delight in my Bible Journaling has led me to a better understanding of how coloured pencils can be utilized within a fine art endeavour. As you may recall, I previously shared some of my testings and one painting I'd done - since then, I've delved into this process more fully and with gusto -- I'm enthralled! My self-education of crash coursing has been so fun as I've experimented with an assortment of surfaces including a variety of papers designed for pencil work, textured surfaces for pastel work and also my beloved Ampersand Pastelbords (which you may recall I used for my oil pastels and pastel pencil work). I've also been testing a wide variety of coloured pencil brands to see which work best on which surface and how the different brands can or cannot work together. I've also tested using water solubles as underpaintings - a technique which makes the pencil work go much more quickly. Along the process, I've learned which of these surfaces and pencils are light fast ... a subject that is critical for my work as its my only legacy to my children and grandchildren and the generations to come as well as my extended family members. This was gifted to my nephew Joshua and his family as a belated baby/family gift. I had already had the set of FC Polychromos pencils which I had innocently purchased, thinking they would work for fine detailing in my oil pastel work because the Polychromos brand of pencils is considered as oil based. **blush** Ahhh the ignorance of beginnership. LOL Luckily, these pencils are considered one of the finest brands to have for the fine art endeavour as they are well made and light fast. I had already had a 36 set of the Lyra Rembrandt pencils, which David had purchased for me way back in the oil pastel adventures as this brand was also labeled "oil based" by the vendors. They are very similar to the Polychromos and brought some lovely pigment additions that I felt were missing from the Polychromos line. I had purchased a resource book that indicated these pencils were very well ranked in light fastness, so I purchased more of their colour lines to complement my Polychromos. Unfortunately, I have since learned that that resource was invalid and this brand is not well ranked in light fast. I bought an assortment of colours within the Caran d' Ache lines of their Luminance (wax based) and their Pablo (less wax based) line of pencils. These are classified as the best made pencil on the market and cost a pretty penny, I might add, but are well worth it. The Luminance especially work well with the Polychromos and brought some of the colours I felt were sadly lacking in the Polychromos line - tan browns (for natural Caucasian skin tones) along with varying ranges in Ochres and Siennas plus a range of Paynes Grey which I've always loved with my Genesis Oil Paintings. The Pablos brought some very light pigment colours that I especially appreciated as well. So, I have had a lot of pencils to enjoy! I've also discovered that pencils need fixatives now and again, and have been delighted with Brush and Pencil's line of product. Their Texture Touch up offers the opportunity to use the glazing techniques I've loved with oil paints and can now do with coloured pencils - a process unheard of before with pencils! As well, all of their fixatives are non-toxic and I can use indoors, without harm to David or the animals. I SO appreciate that! Enabled by using this Brush & Pencil Texture Touch-Up product! a 1" of the touch-up product, covering 1/2" on sand and 1/2" on the water. that the Coloured Pencil Teachers and Experts had told me was not do-able in pencil. Never tell me its impossible! I've recently joined the Color Pencil Society of America (CPSA) and am eagerly and no-so-patiently :D waiting for my copy of their light fast testings guide which includes all of my pencil brands, in addition to gobs and bunches of others, up to and including watercolor pencils! They've put all of these pencils through rigourous and extensive light fast testings and I'm well assured their results will be of great benefit to my endeavours. And so, the testing and creative fun continues with the pursuit of fine art in coloured pencil. With each piece I do, I learn more skills and become more refined in my techniques. I've learned that foam board 1/8" works well to tape my surfaces to - its lightweight means my strength issues aren't impacted at all and 1 sheet got me two sets of foam boards to accommodate each of the size surfaces I most use. I've found pencil cases that afford a small footprint, open like a book and flip pages of elastic loops which hold the pencils firmly in place yet are easily removed - and it all rests naturally on the arm of my bedchair. I've found more free photo reference sites through an assortment of Coloured Pencil Groups to which I belong, so there's no end of creative days ahead of me. Its truly captured my heart and even on bad health days, its easy for me to work on small pieces. "When you look for me, you will find me. Yes, when you seek me with all your heart." I am so truly and abundantly blessed! As you may recall, the last post was the introduction to my new journaling Bible. I'm delighted to say that my adventures continue and have opened up a world of hearts and souls who are also dedicated to exploring God's Word through our artistic endeavours! I've been crash coursing what art mediums work best, adding tip-ins through inserted pages and tags, and learning and sharing results among any number of Bible Journaling groups -- grand fun! I've invested in a few additional supplies to the Prismacolour Premiere pencils, which include chalk stamping pads, Koi Watercolours, Gel pens, a bit of washii tape, and a few sets of assorted stamps that I know will work nicely in my designs. "My Fill My Cup Lord"
"... a new song in my heart"
to complement her lovely theme. Labels: Art Bible Journal, Bible Journaling, Chalk Ink Pads, Illustrated Faith, Koii Watercolours, My Creative Bible, Super Doodle Glitter & Gel Pens, Uniball Signo White Gel Pen.